Although urine spraying is typical in sexually intact cats, approximately 10% of neutered males and 5% of ovariohysterectomized females urine spray.1 Inappropriate urination of all types—toileting behavior as well as marking—is the most common behavior problem encountered in cats. Although statistics of lifetime occurrence are not known, it is likely that a significant percentage of pet cats will urinate or defecate outside the litter box at some point in their lives. However, a substantial number of these cats are marking rather than toileting. Knowledge of the risks, presentation, diagnosis, and treatment of urine marking is, therefore, critical for veterinarians. Urination can have more than one function. Sign of stress or arousal related to the social or physical environment. We usually think of marking as spraying behavior, in which cats back up to a vertical substrate and spray a small amount of urine. However, cats may also urine mark on horizontal surfaces. The latter behavior resembles urination for toileting purposes, with a few important differences (see Table, page 49). Table. Is It Urine Marking or Inappropriate Toileting? Learned preference for a nonlitter substrate or location. 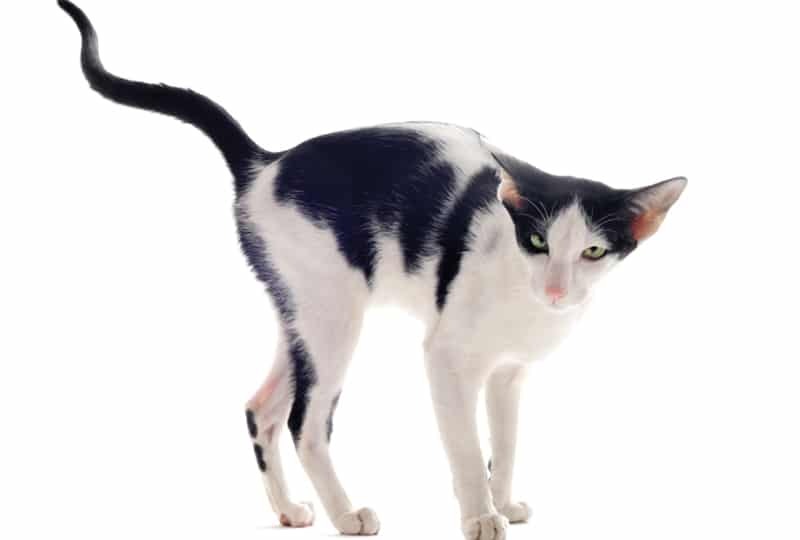 Not uncommonly, all three might be involved when a cat with lower urinary tract disease associates the litter box with pain/dysuria and urinates elsewhere in the home. Even after resolution of disease, the cat might easily have learned to prefer the “inappropriate” spot. Once disease is ruled out or treated, if inappropriate toileting persists, it is assumed to be a primary behavioral problem. Management of inappropriate toileting behavior, no matter what the cause, should focus attention on the cat’s litter box environment. When cats urine mark, they tend to deposit small amounts of urine on objects and surfaces that have some social significance, are central and visible to others, and/or are near windows and doors through which the cat can view other animals outdoors. Examples of socially significant objects include dirty laundry, gym bags, books and keys, shoes, pillows, and furniture. Because the point of such marking is typically to “advertise” their pheromones, it makes sense that they do not attempt to cover the urine, but simply walk away. Reducing anxiety through drug therapy. Regardless of duration or presentation of the problem, any urination outside the litter box, including marking, should be addressed initially as a possible manifestation of disease. Although disease is more frequently associated with inappropriate toileting behavior, presumably due to pollakiuria and stranguria, it may also be associated with urine marking. In one study of urine marking cats, 38% were found to have a urogenital medical condition and/or crystalluria.3 A minimum database would include a CBC, serum biochemical profile, urinalysis +/- urine culture and sensitivity, and imaging. It is important to remember that inappropriate toileting or urine marking may become learned and persist after the cat’s disease is treated. Owners should be asked to keep a log tracking the frequency, pattern, locations, and contexts related to urine marking. If a cat that sprays 3 times per day, decreases his sprays to twice a week, it is a significant improvement that, without a diary, might not be acknowledged. Water sprays and other forms of punishment for urination. Removal of stressors does not have to be literal to be effective. Clearly, it is not possible or desirable to simply remove other cats in the home. It is important, however, to address the social relationships among multiple cats. Any conflict, fear, or other antagonistic behavior should be acknowledged and managed with separation, desensitization, and interruption (but not punishment). Conflicts among household cats do not have to include overt fights; one cat can obstruct the other’s access to food, litter, or resting spots simply by sitting in the middle of a room. Environmental enrichment has begun to be recognized as essential to feline well-being. Many cats are not only expected to live indoors for life but, in many cases, to share the home’s limited space and resources with other cats as well as dogs and humans. Creating a Comforting Environment: It is always informative to ask your clients where the cat tends to spend his or her time. Some cats will “spread out” through the environment, while others are usually found in a smaller area. The important message here is that the cats’ needs should all be met within the area where they spend the most time, especially if another cat in the home happens to be more confident. There should be access to vertical resting spaces where the cat can view the environment in safety. Each individual, particularly the urine marking cat, should have a “safe haven” from the others. 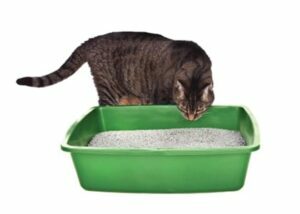 Ensuring each cat in the home has easy access to at least one large, clean, uncovered litter box (ideally without encountering another pet). Food & Water: Many otherwise conscientious owners overlook the food bowl—or even its vicinity—as a resource for which cats might compete. Because cats generally are solitary feeders, there is usually less concern with the cats’ food than there might be with dog food bowls in a multiple-dog home. However, one cat can certainly obstruct another’s access to a food station. Ideally, to reduce social stress, there should be food and water stations in several locations in the home. Block Evidence of Outdoor Cats: Windows can be obscured with a temporary “frosty glass” product, and furniture can be moved away from windows and doors when possible. If your client lives in a neighborhood crowded with feral or free-running cats, one or more motion detectors (some spray water while others produce a sound) can help keep them out of the yard. Clean & Neutralize Urine Odor: There are several commercially available enzymatic urine odor neutralizers that should be used on surfaces after washing the area with mild detergent. Provide Scratching Posts & Facial Rubbing Stations: To encourage cats to mark with their claws or by facial rubbing (bunting) instead of urine marking, it may be helpful to provide attractive scratching posts of sisal rope, corrugated cardboard or fabric, and rubbing devices (eg, Cat-A-Comb, lambertkay.com). It is possible to train cats to redirect away from certain locations (eg, previously urine-marked areas) or social interactions with other cats. Classical conditioning can be used to teach the cat to associate food with the sound of a treat box, small bell, or can-opener, using the conditioned response to the sound to get the cat’s attention. This strategy is useful for “changing the subject” when the owner senses tension or can anticipate urine marking. Operant conditioning shapes behavior through positive reinforcement and allows cats to be trained to go, on cue, to a predesignated spot. These simple tools can interrupt social tension among cats in the house or, in the case of single cats, between the cat and family members. However, they can be used only when the owner is present. For roughly three decades, both surgical and pharmacologic therapies for urine marking have been attempted. Surgical procedures, such as olfactory tractotomy (to eliminate the sense of smell) and ischiocavernosus myectomy (to interfere with the physical ability to spray urine) were described but were not widely used or always successful. The impracticality and questionable ethics of these procedures led to their being abandoned in favor of pharmacologic and environmental therapies. Progestins, such as megestrol acetate and medroxyprogesterone acetate, were used for many years with mixed clinical effects, often more useful in males than in females, although the mechanism of action was not well understood.5 Long-term use of progestins was associated with severe effects, including mammary adenocarcinoma and diabetes mellitus and, eventually, interest in this class of drugs faded. How long should drug therapy be relied upon? Generally speaking, a trial of at least 4 to 6 months is recommended. Avoid abrupt discontinuation and, while tapering the drug, monitor urine marking. Some cats may require longer-term or even lifelong treatment, particularly if the stimulus for urine marking cannot be identified and removed. Finally, be aware that there might be more than one “culprit” in multiple-cat homes. If possible, all cats (or, at the least, all suspected cats) should be examined and evaluated for urinary tract or other disease. It is safest to err on the side of caution and include all cats when working with environmental and behavior modification. Drug therapy should be targeted to the urine-marking cat(s), but may also be needed in others if there is ongoing social conflict. The most reliable method of identifying culprits is to videotape the frequently-marked spot. Urine marking is common, especially in multiple-cat homes. In order to prevent it, clients should be aware that it can be triggered by both direct (ie, litter box problems, organic disease) and indirect (ie, social conflict, frightening or arousing environmental stimuli) issues. If treatment is approached systematically, it is a manageable problem. Hart BL, Cooper L. Factors relating to urine spraying and fighting in prepubertally gonadectomized cats. JAVMA 1984;184:1255-1258. Bergman L, Hart BL, Bain M, et al. Evaluation of urine marking by cats as a model for understanding veterinary diagnostic and treatment approaches and client attitudes. JAVMA 2002; 221:1282-1286. Frank DF, Erb HN, Houpt KA. Urine spraying in cats: Presence of concurrent disease and effects of a pheromone treatment. Appl Anim Behav Sci 1999; 61:263-272. Pryor PA, Hart BL, Bain MJ, et al. Causes of urine marking in cats and effects of environmental management on frequency of marking. JAVMA 2001; 219:1709-1713.
Cooper L, Hart BL. Comparison of diazepam with progestin for effectiveness in suppression of urine spraying behavior in cats. JAVMA 1992; 200:797-801. Center SA, Elston TH, Rowland PH, et al. Fulminant hepatic failure associated with oral administration of diazepam in 11 cats. JAVMA 1996; 209:618-625. Hart BL, Cliff KD, Tynes VV, et al. Control of urine marking by use of long-term treatment with fluoxetine or clomipramine in cats. JAVMA 2005; 226:378-382. Neilson NC. Feline house soiling: Elimination and marking behaviors. Vet Clin North Am Small Anim Pract 2003; 19(2):216-224.